September the 15th saw another round of changes take place in East London, this time around the Stratford and Mile End area. Routes D6 and D8 left their home for the past 5 years with Go Ahead at Silvertown with the D6 moving to CT Plus at Ash Grove and the D8 returning to Lea Interchange, albeit this time under Tower Transit ownership. 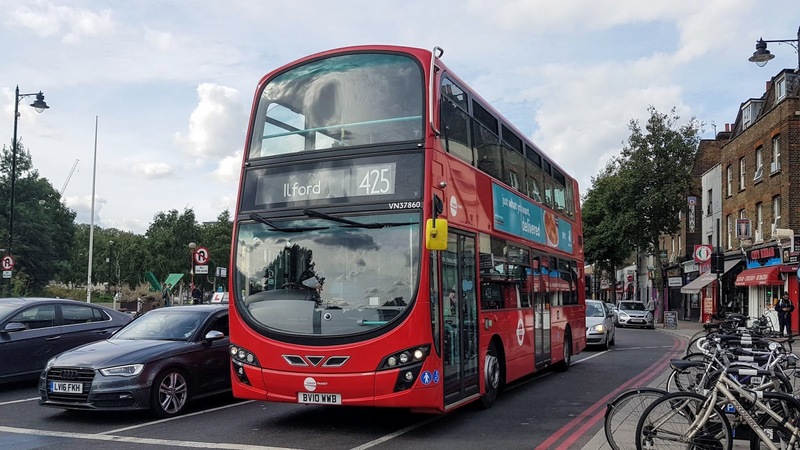 At the same time route 425 was extended from Stratford Bus Station to Ilford, Hainault Street and the short workings on route 25 between Ilford and Mile End were withdrawn meaning all buses on the route are now scheduled to run between Ilford and Oxford Circus. Starting off numerically. Route 425 is among London's newer routes only starting operation in 2008 with Go Ahead London out of Silvertown (SI) and it ran between Stratford Bus Station and Clapton, Nightingale Road. 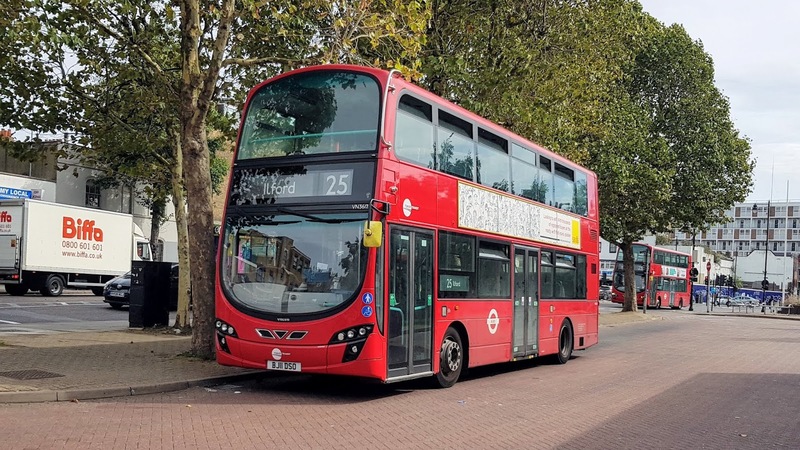 It was introduced to replace a part of the S2 route which was withdrawn, the route differed from the S2 in that it was routed via Mile End so that it could avoid a low bridge which used to restrict the S2 to single deckers. Go Ahead operated it using Scania Omnicity vehicles, although these were withdrawn from service when Tower Transit won the route in 2013, marking their first route gain (although technically it was First who won the route) with Enviro400s. Due to the route's short history the extension to Ilford is the first time that the route will have been altered since introduction. Route 425 was originally announced to be extended during May 2017 and 425 tiles even started appearing at bus stops between Ilford and Stratford, although soon after these were covered with white stickers and then removed completely, causing doubt over if the extension would even take place. Although it finally did more than a year later! The extension allowed the short workings on route 25 between Mile End and Ilford to cease, providing a uniform Oxford Circus to Ilford service on the route for the time being. These workings have changed throughout the years, introduced in 2011 when First took on the route from Stagecoach the short workings ran as far as Holborn Circus. Subsequent changes to the road layout there resulted in the shorts being cut to City Thameslink Station and then Bank (although sometimes referred to as Mansion House by the iBus). 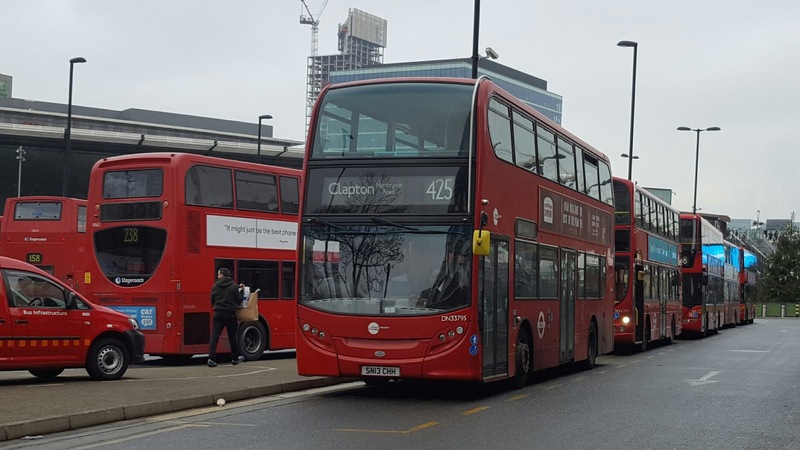 It wasn't until the Aldgate gyratory removal works, and the massive impact this had on the 25s service that the decision was taken to make these short workings only go as far as Mile End. This was initially said to be temporary, but unsurprisingly it remained since and it's probably safe to say that the high frequency on the 25 won't ever reach Central London again. 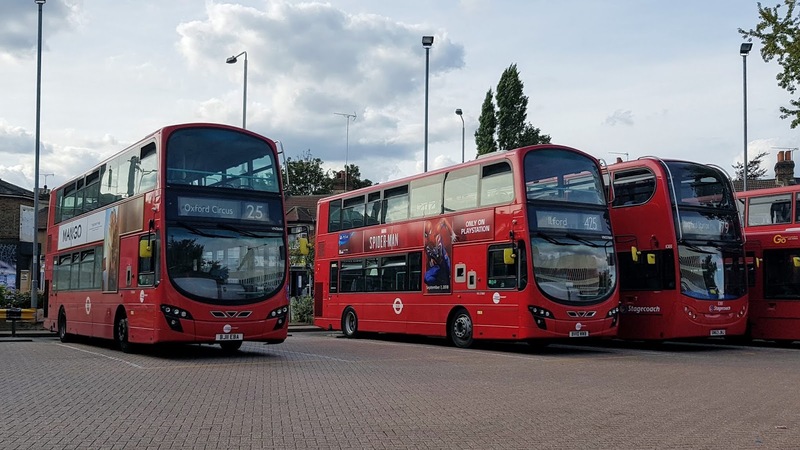 These changes have ultimately resulted in some substantial changes to bus frequency along the Romford Road corridor. The previous every 3-4 minute frequency on the 25 has now dropped to an every 7-8 minute frequency. Route 425 supplements this with a bus every 10 minutes. Route 86 is now the most frequent route on this corridor, with a bus continuing to run every 6 minutes. Route D6 has been around for a longer while than the 425, although similarly it's managed to avoid many major changes throughout its existence. The route started in 1989 running between Hackney Central and the Isle of Dogs District Centre, which today is Crossharbour Asda. In 2013 the route was withdrawn between Hackney Central and Ash Grove. 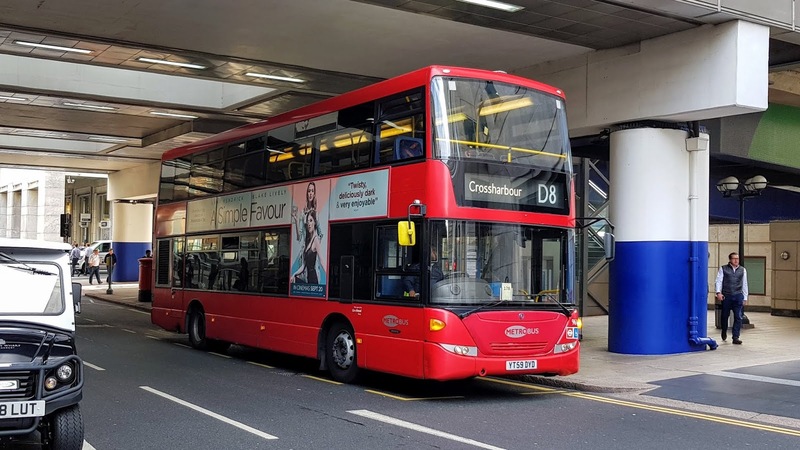 Over the years it has seen fluctuations between single and double decker operation although at the moment it is currently a single decker route - although many people think it should be converted to a double decker route due to the loads that it gets. Its last stint before making the move to CT Plus saw it housed at Silvertown under Go Ahead London. 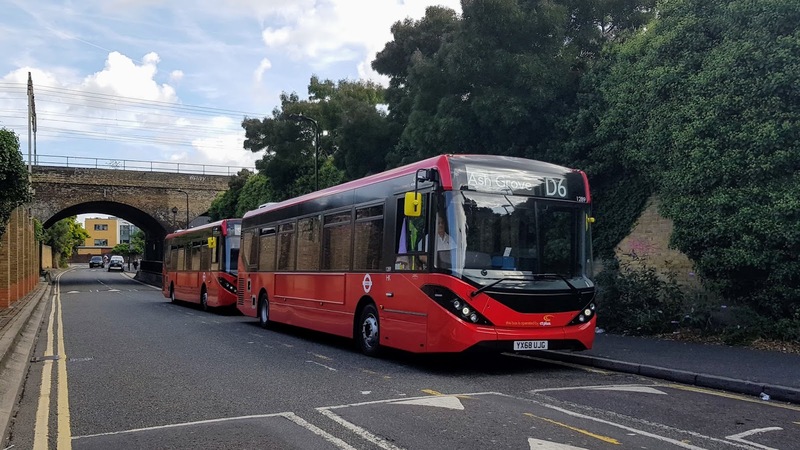 It was allocated with Enviro200s which should now be making their way to the 300 at River Road (RR). Route D8 is slightly younger than the D6, starting operations in 1991 running between Stratford Bus Station and Crossharbour Asda although unlike the route that is in operation today it used to run via Devons Road and via Cubitt Town. 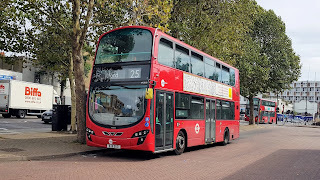 The route was rerouted away from Cubbit Town in 1999 and away from Devons Road to run direct via the A12 in 2016 which was covered in this post from 2016. 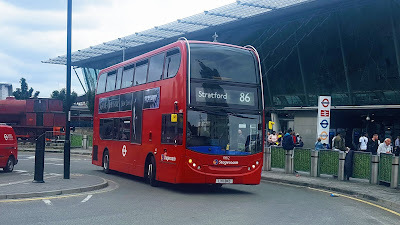 In 2011 the route's Stratford terminus was altered to Stratford City and then in 2013 the route was extended to Stratford International Station. 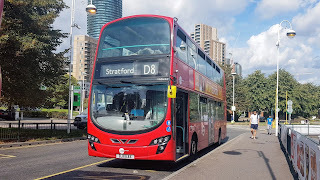 But on the same day the route was rerouted away from Devons Road in 2016 the Stratford Bus Station terminus was restored with the other section being taken over by route 108 instead. This day also saw it converted to Double Decker operation, which has been very controversial due to the light loads that this route has to deal with. Like the D6 its previous stint saw it housed with Go Ahead London at Silvertown (SI), it was allocated Scania Omnicities and was the only route in the Go Ahead London empire to have a full allocation of them. 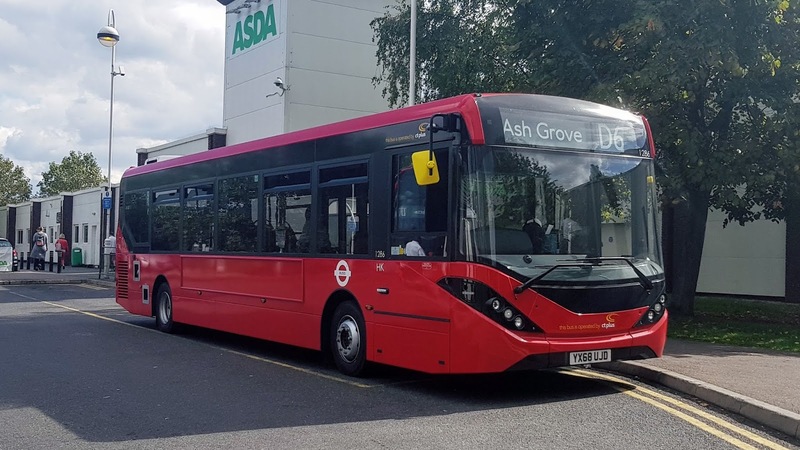 At the time of the award the D8 was announced to be using buses made spare by the loss of the 30, which went to Metroline a few months prior to the change. Although later the 425 was also awarded to Tower Transit using the same buses causing doubt whether the D8 would use the 30s old Enviro400s. 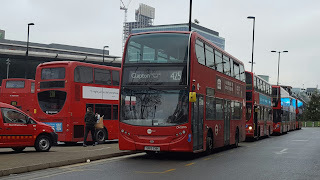 Soon afterwards it was confirmed that neither the 452 nor the D8 would use the 30s old Enviro400s and they would both instead use buses that were made free by adjustments to the 25. As for those Enviro400s they will now be heading over to Go Ahead London ready for the uptake of route 51 in December this year. Go Ahead wrapped up their phase on the D6 and D8 on Friday the 14th of September, with the last of the Mile End shorts on the 25 also operating as scheduled for the last time. 959 formed the last D8 while SE128 formed the last D6. On the first day I ended up covering the changes in a rather erratic order however I'll go through them per route. The D6 seemed to be doing decently, although bunching was evident throughout its first day. As expected the allocation on the route was fully Enviro200 MMC, and more specifically the 68reg batch numbered between 1283 and 1295. After arriving at Crossharbour I popped into Asda to pick up some sweets to keep me busy through the journey. Although somehow that resulted in me missing two buses, luckily the third bus wasn't too far behind, 1286. Upon boarding the bus the new bus smell was evident, although something else that was evident was a load of chicken bones abandoned on the seats. I'm personally not sure who eats chicken at 11 in the morning although someone needs to teach them what bins are. Throughout the journey the bus was decently loaded, with a good portion of it being standing room only. 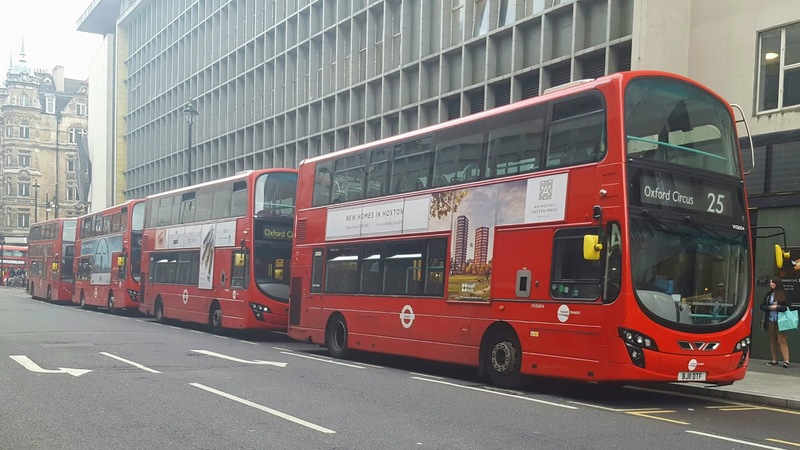 There have been calls to have converted this route to double decker operation instead of the D8, and it's no surprise to see why these calls are being made. 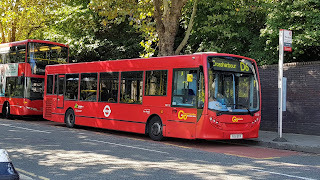 The biggest issue I had with the D6 wasn't actually anything to do with CT Plus in particular, more to do with TfL and their recent specifications for buses. 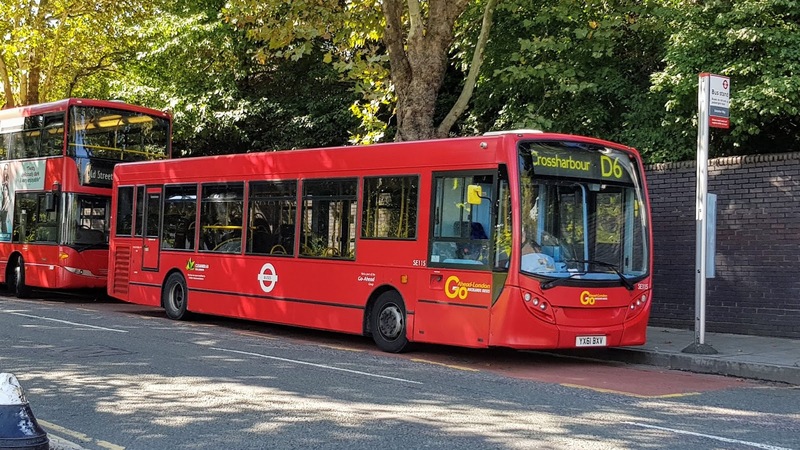 Buses now need to come equipped with a start stop system and on Enviro200 MMCs in particular the whole bus can violently shudder when the bus restarts, leading to a very uncomfortable experience. 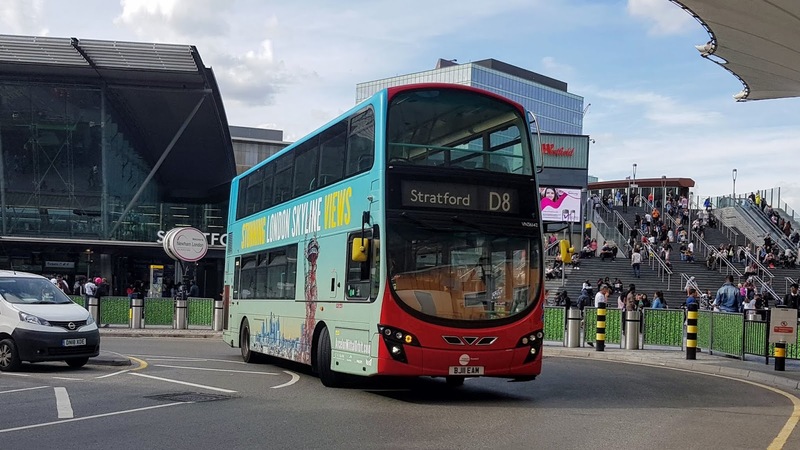 The stop start system has also attracted controversy on whether it offers genuine savings or benefits, most notably from Mercedes Benz who don't put it in their buses. The D8 seemed to be having a few more problems than the D6 was having on its first day. As expected the route's allocation was completely made up out of VN class buses. 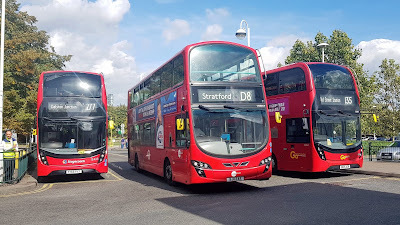 When I arrived to sample the route I ended up waiting longer than I'd have needed to, and when the bus finally did arrive, in the form of VN36144, it took us ages to just leave Stratford due to the roadworks caused by the gyratory improvement scheme in the area. This was no doubt presenting Tower Transit some challenges with the route. Thankfully after we made it past Bow the traffic died down and I could enjoy the ride down the A12 and into the Docklands. While I am on about the gyratory works, the D8 will see a minor re-routing from Monday the 17th of September where it will exit the bus station and head straight to Stratford high street no longer serving the Broadway, there will also be a stop change in the bus station which will see the first stop moved to where the current alighting point is. The VNs on the D8 allow for a more comfortable journey on the route than the previous Scania Omnicities which were very worn out by the time the contract on the D8 expired. As I mentioned earlier the D8 has been well known among the enthusiast community for its controversial double decker allocation. However one thing that I have realised is that the usage on the route is certainly starting to pick up, it's very common to have healthy loads on the bus and maybe the double decker allocation on the route is finally justified 2 years after the conversion! The buses are also in quite good shape despite working on the 25 for the past 7 years. Hopefully as time goes on the issues on the D8 will start to be ironed out and Tower Transit will be able to provide a good service on the route for the forthcoming 5 or maybe even 7 years. After completing both the D6 and D8 I headed to Clapton to take a ride on the newly extended 425. I didn't have to wait too long after I arrived until the bus, VN37860 departed. At this point I realised that I didn't actually have enough photos of the 425, so decided that I'd bail at Mile End and race the bus on the Central Line to Stratford to give me a photo opportunity. When we got to Victoria Park we caught up with the bus in front, a DN and we got waved on to overtake by the driver of that bus. The buses then played leapfrog to Mile End where I got off for the Underground. Upon arrival at Stratford the VN had managed to get 3 minutes ahead of the DN. I was initially planning to get the VN again although when it arrived it got completely swamped with a crowd - something I've never seen on the first day of a newly extended route although something which was good to see. Before the DN arrived an 86 also went ahead, emptying out the bus stop a bit which gave me a relatively empty 425 to enjoy to Ilford. 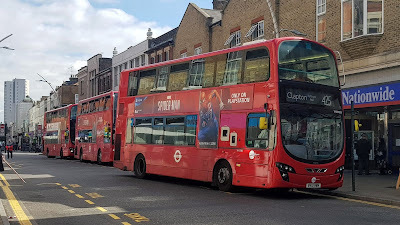 Although this bus was still carrying a very healthy load, it was almost as if the route was well established on the Stratford to Ilford corridor. We did get caught in a bit of traffic, but that's expected along Romford Road. After making it past the North Circular Road is was smooth sailing into Ilford Town Centre which would mark the new terminus of the route. Despite this change is seemingly for the good, it's not hard to see that this is another move in the grand scheme to save money on the public transport system. 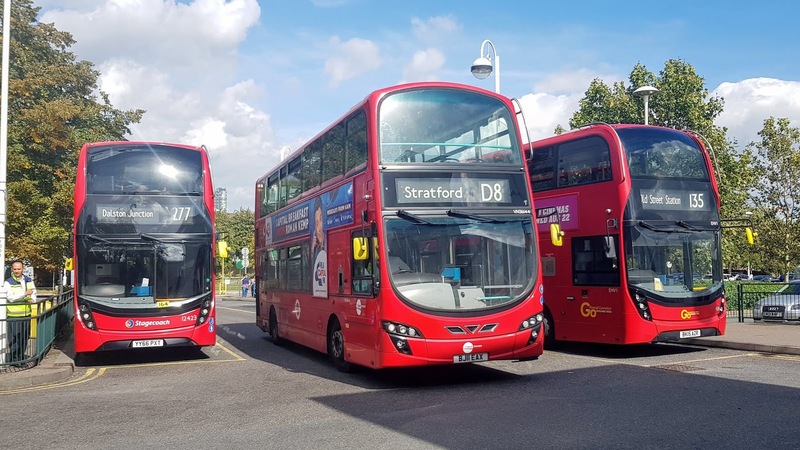 The 25s PVR has come down by 24 buses from 64 to 40 with the 425s PVR going up by 12 in return, providing a saving of 12 buses on the Stratford to Ilford corridor. 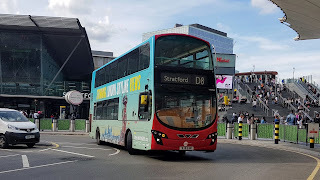 It's no secret that the amount of people who use the bus between Stratford and Ilford has fallen with the fall potentially attributed to the increase in traffic and speed it takes on the bus although is further reducing the frequency on the routes going to persuade people to start using public transport again? I personally don't think so. This move isn't the last of such either, on the 1st of December the 25 is planned to be withdrawn between Oxford Circus and Holborn Circus. This was meant to be done in connection with the introduction of Crossrail which was expected to start on December the 9th but that's now been delayed until Autumn 2019. It's yet to be seen if this will also delay the cull of the 25. Oh, and it's not just the 25 that's being subject to these sorts of changes, come November this year route 10 as we know it will no longer exist and many more are to come. As these changes can change at short notice I advise you to keep a close eye on the Tenders Page which will be updated with information as soon as we get it. How do you feel about these changes? 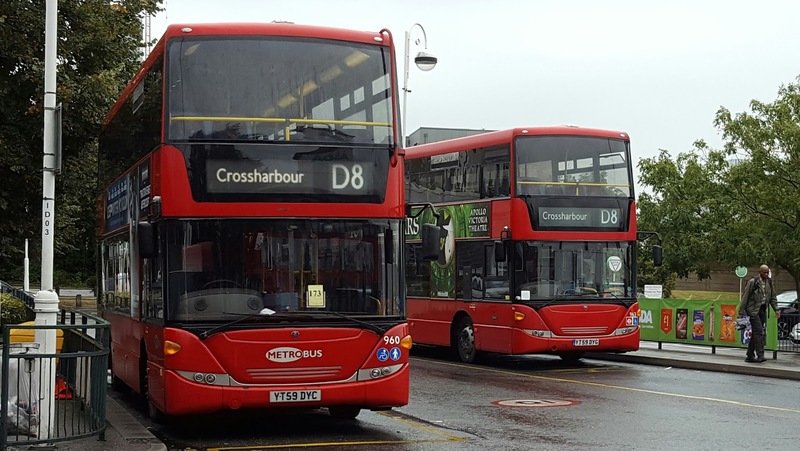 Do you think routes D6 and D8 have a good future ahead with their respective new operators? Do you think the changes to the 25 and 425 were ultimately the right decision? Let us know in the comments section below.